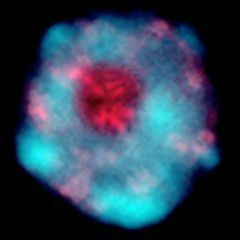 Hereditary defects in the gene encoding the p53 molecule can lead to the explosive development of cancer cells. Researchers discovered this in a number of aggressive brain tumors in children. This explosion allows cells to very easily degenerate into cancerous ones. 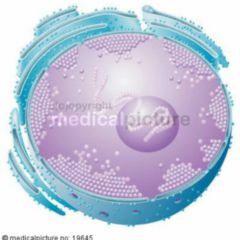 In a healthy body, the number of new cells produced exactly matches demand. But sometimes, despite the variety of protective mechanisms, a cell breaks out of the formation and multiplies unabated – cancer develops. We now know that genetic changes are the underlying causal factor in any malicious tumor, something which affects several classes of genes. Genes are sections of the hereditary molecule DNA; they carry the blueprints for proteins. A damaged gene may produce a defected protein, too much, too little or none of the protein – with fatal consequences. The first step towards a cancer occurs when a so-called oncogene is made overactive via mutation because these genes stimulate cellular growth. The pathological effect only shows up as an outcome when at the same time a tumor suppressor gene, such as p53, is damaged. 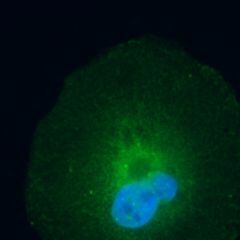 In describing these two classes of genes a car is often brought in as a comparison: In this picture, the oncogene would be the accelerator for further cell growth; p53, however, is the brake. In about half of human tumors there are fatal changes in the p53 gene. The associated p53 protein can no longer fulfill its role as “guardian of the genome”. German scientists headed by Prof. Dr. Peter Lichter from the DKFZ and Dr. Stefan Pfisterer from the University Hospital Heidelberg determined the presence of a significant change in the tumor suppressor p53 gene in a particular young girl who was suffering a SHH medulloblastoma. 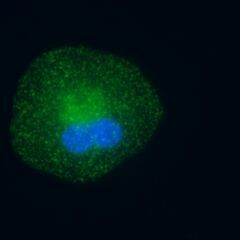 This protein holds back cell division after damage occurs to genetic material, so that the cell gains time to repair the DNA defects. If the damage is irreparable, p53 thus ensures that the programmed suicide of the cell (apoptosis) Is initiated. When the scientists, together with Dr. Jan Korbel from the European Molecular Biology Laboratory (EMBL),deciphered the tumor genomic tissue of the young patient, they were surprised by the unprecedented chaos: individual sections of chromosomes were broken in countless places and irregularly reassembled, so that entire genomic regions were missing, while others were copied or inserted in the wrong orientation. This vast extent of damage was different from previously known genetic defects in tumor cells. Scientists refer to such damage in the genome using the term “chromothripsis”. This recently discovered phenomenon occurs in approximately two to three percent of all cancers. It is believed that a single event in the cell allows the chromosomes to almost explode. A gradual accumulation of individual mutations, as is known from most cancers, can not however explain such chaos. The Heidelberg researchers then subjected tissue samples of 98 medulloblastomas to genetic analysis and discovered in 13 samples chromosomal chaos typical of chromothripsis. Eleven of these 13 samples again were particularly aggressive SHH-medulloblastomas. In ten of these eleven samples, the researchers found mutations in the gene for p53, which were largely hereditary. “In all patients with an inherited defect in p53 we find chromosomal chaos in the cancer cells. By contrast, no tumor sample with an intact p53 gene shows the pattern of damage – the correlation is highly significant”, reports Lichter. “A p53 mutation apparently predisposes the cell to chromothripsis. However, we do not yet know whether the mutation in the chromosomes makes them more vulnerable and fragile, or whether the mutation, despite the chromosomal chaos, keeps the cell alive. Actually, the cell’s death would be the normal response to such massive DNA damage”, adds Korbel. Such an accumulation of chromothripsis in one singular type of cancer was until now not yet known. A connection between a particular gene defect and chromothripsis had also been missing. The study was part of the PedBrainTumor Network, which is supposed to decipher the genetic information of brain tumors which have the highest mortality rate among children. The network was made possible in 2010 by cooperation between German Cancer Aid and the Federal Ministry for Education and Research of Germany (BMBF) and is supported with a total of € 15 million, eight million Euros of which is for German Cancer Aid. The project is the first of what is now three investments in the International Cancer Genome Consortium (ICGC). In this largest and most ambitious biomedical research project since the Human Genome Project, leading researchers around the world have set themselves the goal of deciphering the genome of 50 forms of cancer in order to find new approaches for improved prevention, diagnosis and therapy. At the National Center for Tumor Diseases Heidelberg in Germany, a joint facility of the DKFZ, Heidelberg University Hospital and German Cancer Aid, a new procedure will commence in the near future, whereby the complete genome of tumor cells of certain cancer patients will be analysed. Each year 450,000 people are diagnosed with cancer in Germany, about half of them die annually as a result of this insidious disease.